Glass is usually the most stable of archaeological materials, but glass artifacts, and 17th-century glass in particular, can undergo complex disintegration. Ideally, glass should consist of 70-74 percent silica, 16-22 percent alkali or soda ash (sodium carbonate) or potash (potassium carbonate, usually derived from wood ash), and 5-10 percent flux (lime [calcium oxide]). Soda-lime glass has been the most common glass throughout the history of glass-making, and the modern equivalent is 74 percent SiO2, 16 percent Na2CO3, and 55 percent lime added as stabilizer. Soda glass is characteristic of southern Europe, where it is made from crushed white pebbles and soda ash derived from burnt marine vegetation. Soda glass, which is often used for the manufacture of cheap glass, is twice as soluble in water as potash glass. 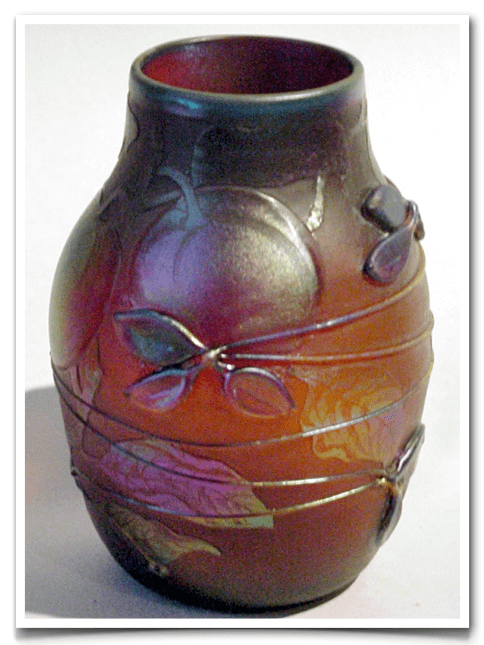 Potash glass is more characteristic of interior Europe, where it is made from local sands and potash derived from wood ash and burnt inland vegetation. A little salt and minute amounts of manganese are added to make the glass clear, but potash glass is less clear than soda glass. Most early glass is green because of iron impurities in the materials. Alkali lowers the melting point of the sand, and the flux facilitates the mixture of the components. As long as the original glass mixture was kept in balance, the resulting glass will be stable. Problems arise when an excess of alkali and a deficiency in lime are present in the mixture, for the glass will be especially susceptible to attack by moisture. If old glass contains 20-30 percent sodium or potassium, it may have ‘glass disease,’ where the glass weeps and begins to break down. In all glass, the sodium and potassium oxides are hygroscopic; therefore, the surface of the glass absorbs moisture from the air. The absorbed moisture and exposure to carbon dioxide causes the NaO2 or NaOH and KO2 or KOH to convert to sodium or potassium carbonate. Both NaCO2 and KCO2 are extremely hygroscopic. At a relative humidity (RH) of 40 percent and above (and in some cases as low as 20 percent RH), drops of moisture appear on the glass surface. In water, especially salt water, the Na and K carbonates in unstable glass may leach out, leaving only a fragile, porous hydrated silica (SiO2) network. This causes the glass to craze, crack, flake, and pit, and gives the surface of the glass a frosty appearance. In some cases, there is an actual separation of layers of glass from the body. Fortunately, these problems are not commonly encountered in glass manufactured in the 18th century and later. Pearson (1987b, 1987d) discusses glass deterioration and reviews the various glass conservation procedures. At our present state of knowledge, the decomposition of glass is imperfectly understood, but most glass technologists agree that glass decomposition is due to preferential leaching and diffusion of alkali ions (Na and K) across a hydrated porous silica network. Sodium ions are removed and replaced by hydrogen ions, which diffuse into the glass to preserve the electrical balance. The silicates are converted into a hydrated silica network through which sodium ions diffuse out. Decomposed glass often appears laminated, with iridescent layers on the surface. Glass retrieved from an acid environment often has an iridescent film, which is formed by the leached silica layers. The alkali which leached out is neutralized by the acid, and fewer hydroxyl ions are available to react with the silica. This causes the silica layer to thicken and become gelatinized. Glass excavated from an alkaline environment is less likely to have laminated layers because there is an abundance of hydroxyl ions to react with the silica network. Usually a protective layer does not form on glass exposed to alkaline solutions. The dissolution of the glass proceeds at a constant rate. The alkali ions are always extracted in excess of the silica, leaving an alkali-deficient layer, which continually thickens as the deterioration moves deeper into the glass. There are considerable differences of opinion as to what to do with unstable glass. Some professionals advise that the only treatment should be to keep the glass in low RH environments so the glass does not have any moisture to react with. While a RH range of 40-55 percent is usually recommended, it varies in relationship to the stability of the glass. The weeping or sweaty condition is sometimes made worse by the application of a surface lacquer or sealant. No resin sealants are impervious to water vapor, and the disintegration continues under the sealant until the glass falls apart. Other glass conservators try to remove the alkalinity from the glass to halt the deterioration. Most, if not all, of the glass manufactured from the 18th century on has been produced from a stable glass formulation, and there are not likely to be any considerable problems presented to the conservator other than normal devitrification. Since the glass is impervious to salt contamination, no conservation treatment other than simple rinsing, removal of incidental stains, especially lead sulfide staining on any lead crystal, and removal of calcareous deposits is expected. The main problems will be related to gluing pieces together. All the problems likely to be encountered are discussed thoroughly Newton and Davidson (1989). Glass that is susceptible to weeping because of unstable glass formulations can be treated in different ways; the technique described by Plenderleith and Werner (1971:345) is representative of the treatments often recommended. It is presented below. Wash the glass thoroughly in running tap water and then soak it in distilled water. Dry the glass in two baths of alcohol. This treatment will retard the disintegration and also improves the appearance of the glass. It does not, however, always stop the breakdown of the glass. If applicable, apply an organic lacquer (PVA or Acryloid B-72) to impede disintegration. For assurance, store the glass in a dry environment with the relative humidity no higher than 40 percent; other professionals say that an RH of 20-30 percent is ideal. The Corning Glass Museum keeps incipient crizzled glass stored at 45-55 percent RH. RH 42 percent is the critical point at which KCO3 becomes moist. The above treatment does not attempt to remove any of the glass corrosion products, which often result in layers of opaque glass that may be removed with various acid treatments. The decision to remove surface corrosion products, which often mask the color of the glass, must be made on a case-by-case basis. Removal of corrosion products may also significantly reduce the thickness of the walls and weaken the piece significantly. Indiscriminate removal of surface corrosion products can weaken, blur, or alter surface details. The corrosion layers of a glass object may be deemed a part of the history of the object, and thus a diagnostic attribute, and should not be removed without good reason. Devitrification is a natural process that occurs on siliceous material. It occurs naturally on flint and obsidian and is the basis for obsidian hydration dating. The surface of any glass from any time period, especially soda glass, usually becomes hydrated through time and so will eventually devitrify. Devitrification occurs when the surface of the glass becomes partly crystalline as it adsorbs moisture from the atmosphere or from a submerged environment. As it becomes crystalline, the surface becomes crazed and flakes from the body of the glass. Devitrified glass has a frosty or cloudy, iridescent appearance. Pane glass is especially susceptible. To prevent further devitrification and to consolidate the crazed surfaces, a coating of PVA or Acryloid B-72 should be applied to the piece. Either of these surface adhesives will smooth out the irregularities in the pitted, crazed surface of the glass by filling in the small cracks and forming optical bridges, making the glass appear more transparent. Merely wetting glass will cause it to be appear clearer for the same reason. Leaded glass, which includes a wide variety of stem wares and forms of lead crystal, can become badly stained by lead sulfide. Glass that is normally clear may be recovered from marine and/or anaerobic sites with a very dense black film on its surface. A 10-15 percent hydrogen peroxide solution is used, as with ceramics, to remove these sulfide stains. Other than stain removal, strengthening of glass artifacts with a consolidating resin is often required. Fragments can be glued together with a good glue, or if deemed necessary, an epoxy, such as Araldite. Glass can be repaired and reconstructed with the same glues as described for pottery. Optically clear epoxy resins are generally preferred as they adhere to the smooth, non-porous glass more readily. They also dry clearer and shrink less than the solvent resins. The resulting bonds, therefore, are less noticeable and stronger than with other glues. The epoxy resins are, however, usually irreversible. Hysol Epoxy 2038 with Hardener 3416 and Araldite are the two brands most commonly used in glass repair. The new ‘super glues,’ which are made of cyanoacrylate, are used quite often to piece the glass together quickly. After using the cyanoacrylate, epoxy is flowed into the cracks with an artist’s brush to permanently bond the pieces. It is exceptionally difficult and time consuming to gap-fill glass. It requires considerable work and experience. The problem of matching transparent glass colors is equally difficult. All of these problems are adequately discussed in greater detail in Newton and Davison (1989). As is the case with all conservation, it is necessary for the conservator to be able to recognize what the problems are and to know what may be used to counter them. When lead oxides are found during glass conservation they can be removed with 10 percent nitric acid. A 1-5 percent sulfuric acid solution can be used to remove iron oxide, neutralize the alkalinity of glass that is breaking down, and, occasionally, to remove calcareous deposits. Calcareous deposits are commonly removed with 10 percent hydrochloric acid and, on some occasions, by immersing the glass in 5 percent EDTA tetra sodium. Iron stains are commonly removed with 5 percent oxalic acid or 5 percent EDTA di-sodium. Realistically, few problems other than reconstruction and restoration are likely to be encountered on any glass objects found in archaeological sites dating from the mid 18th century to the present. In most cases, the same chemicals and equipment required for treating ceramics are also used for conserving glass.